We could say our heroine walked alone on the afternoon of her seventh day on the Via Podiensis, but that would only be partially true. Though she was mostly devoid of human companionship on that day, she did manage to find companionship of another kind. 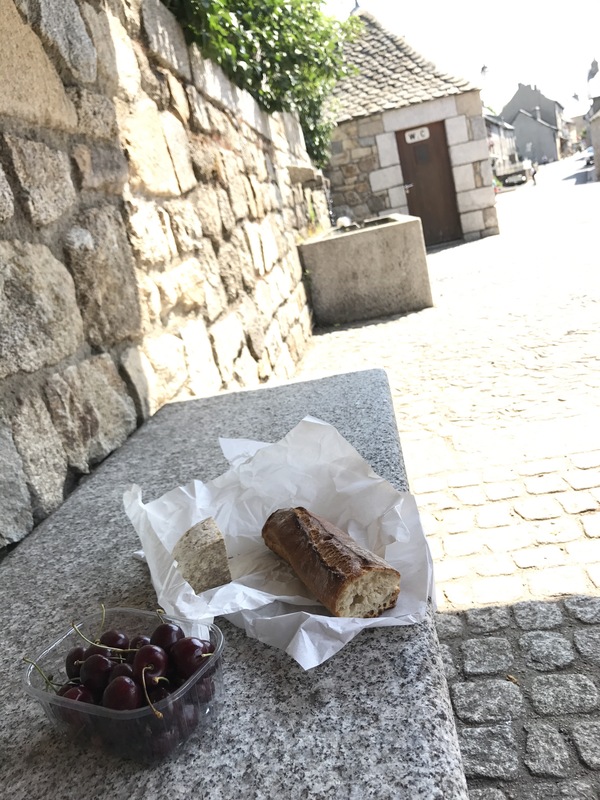 On Saturday, June 24, 2017, after a lunch of bread, cheese, and cherries, our heroine left the small town of Nasbinals and continued her walk through the Aubrac region of France. As she walked the road out of town, a brown and white dog up ahead of her slid under a fence and headed toward a house. But as she walked by the house, he slid back out and caught her eye. She smiled, but didn’t say anything to him, not wanting to indicate that she was in anyway interested in having his company. Not because she didn’t like dogs, but because she didn’t want him to go far from home on her account. But he wanted to join her: he trotted off ahead of her and turned right onto the forested trail, as if leading her. He then took off at a gallop and was soon out of her view. She figured he would turnaround and return to his home but instead, once she got to open pasture land, she saw him sniffing his way across the field to her right. Then the tall grasses hid him from her view. The rolling hills around her were only populated by cows and rocks. The largest rocks dotted the countryside; the smaller ones had been collected and piled into stone walls that crisscrossed the landscape as far as she could see. She walked alone for twenty minutes and then heard heavy panting behind her. She turned to see the dog flying up the trail towards her. She stopped and let him go ahead of her, and watched as he soon took a left under a barbed wire fence and again disappeared from her view. After 3 miles of his disappearing and reappearing, she encountered a French couple walking towards her on the trail. 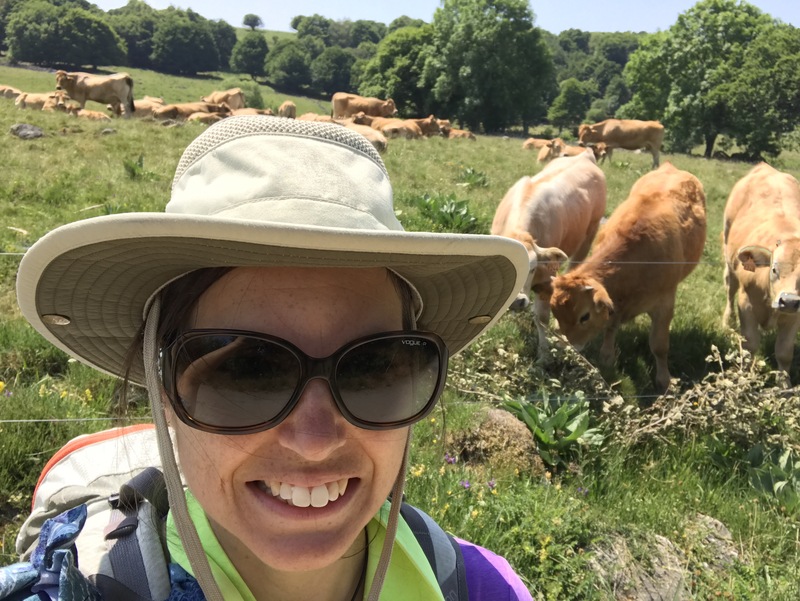 They were on the Tour d’Aubrac — another walk in the area. They greeted each other and when she was asked how her walk was, she pointed to the dog and said he had been with her since Nasbinals. She wondered aloud if he would return home. The French couple tried to call him, but he just looked and then went on about his business in the pasture. 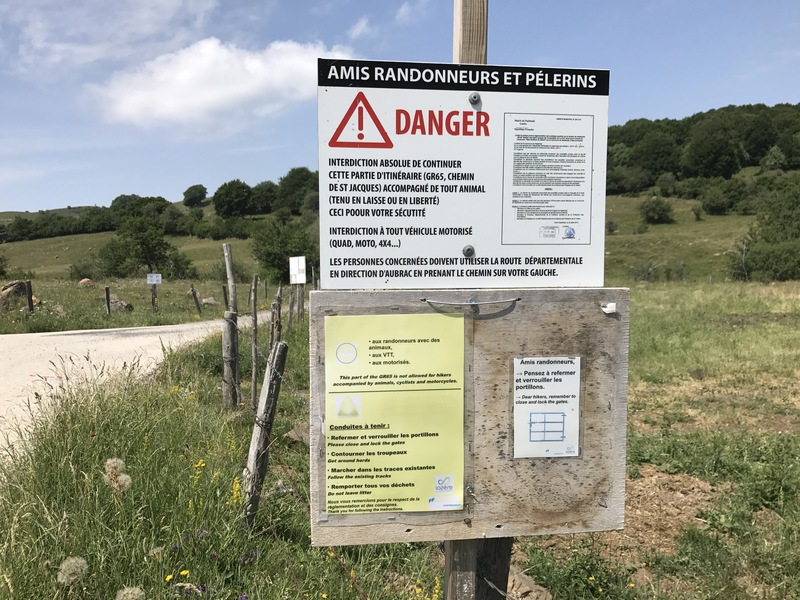 Our heroine soon arrived at a large sign that indicated–in both French and English– that beyond this fence only pilgrims were allowed. No dogs, no horses, no bicycles, no motorized vehicles. She had read about this area on the Internet the night before. She would be walking through pastures in which cows and bulls were dining. She imagined the farmers didn’t want other animals or bicycles to agitate the inhabitants of these fields. But there was nothing to keep an unleashed dog from entering. She had taken to calling the dog Naz, short for the name of the town in which they met. She never called him by name, though. Nor did she feed him or even touch him. She thought by ignoring him he might decide it was time to go back to people that loved him. But she had no such luck. When she stopped at the sign he showed up next to her. He then trotted into the pasture and she watched as the cows paid him no mind, nor he them. Maybe this was a regular route for him? Was he there so often that they no longer cared? Whatever it was, she took it as a good sign, opened the fence, closed it behind her, and stayed on the trail. She hoped Naz would stay far enough ahead of her that if he happened to agitate any of the animals, she would have enough time to act. What would she do? She hadn’t yet figured that out. Slide under the barbed wire fence perhaps? 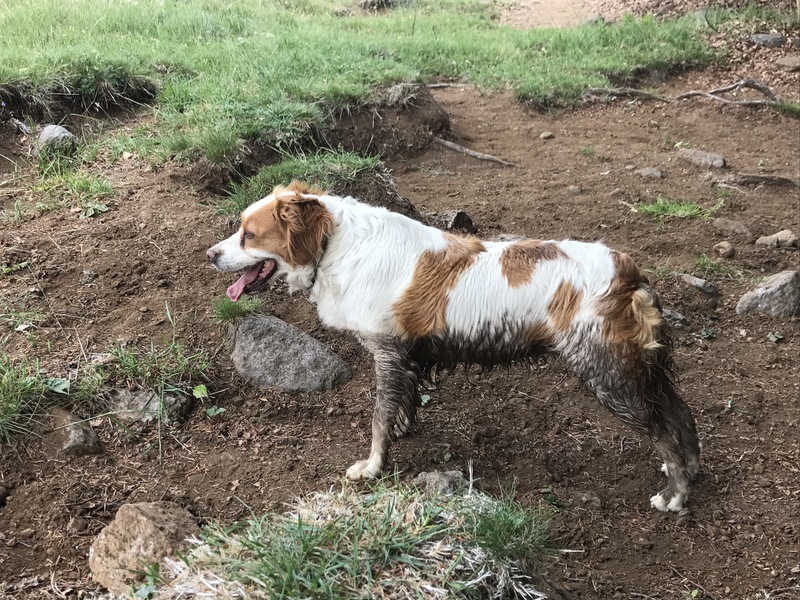 Naz disappeared from her view again, showing up thirty minutes later with his legs and belly covered in mud. He eventually saw a couple ahead of our heroine and ran to join them. But when she stopped for a break, he trotted back down to her, sitting beside her pack and smelling worse than she did. It was not just mud he had walked through apparently. After 6 miles of walking together, she arrived at her accommodation for the night. Naz had disappeared again but after she checked into her gite, she saw him walking around the parking lot. She explained to the owner of the gite that the dog was not hers, how he had followed her since Nasbinals. Thankfully, he had a collar which held a tag with a phone number. The woman called and his owner came to pick him up. Turns out Naz wasn’t a “he” at all. Her name was Jenny, and when her owner arrived in a pick up truck, Jenny jumped into the bed. The owner thanked us for calling, and with that, our heroine’s afternoon companion finally returned home. Our heroine has the habit of getting into trouble on the third day of her Caminos. 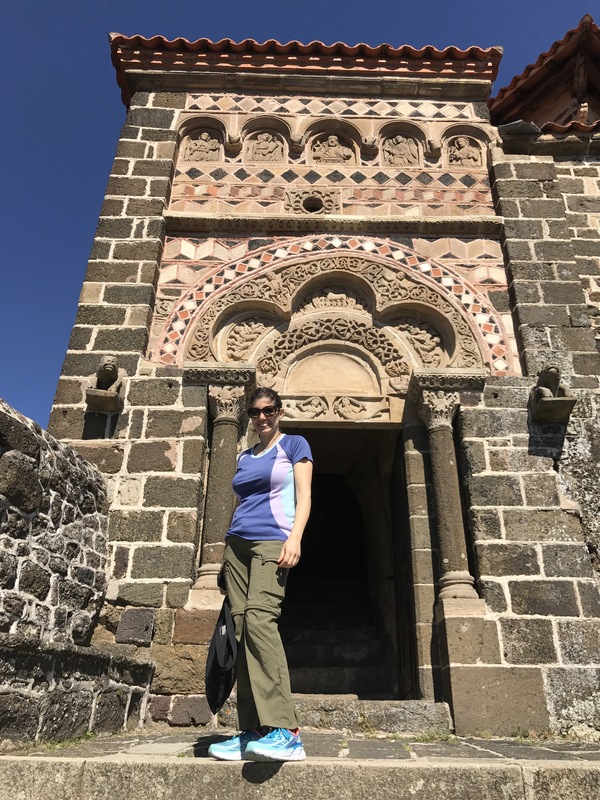 We recall her first Camino when, at the suggestion of new Camino friends, she walked past her intended stop of Zubiri in favor of a promised nicer town: Larrasoaña. Her friends were right — the town was nicer than the gritty Zubiri, but the only restaurant in town was closed, and there was a question as to if the market would open that evening. But the worst part? The next morning she woke to find she was unable to put weight on her left foot. But that’s another story. 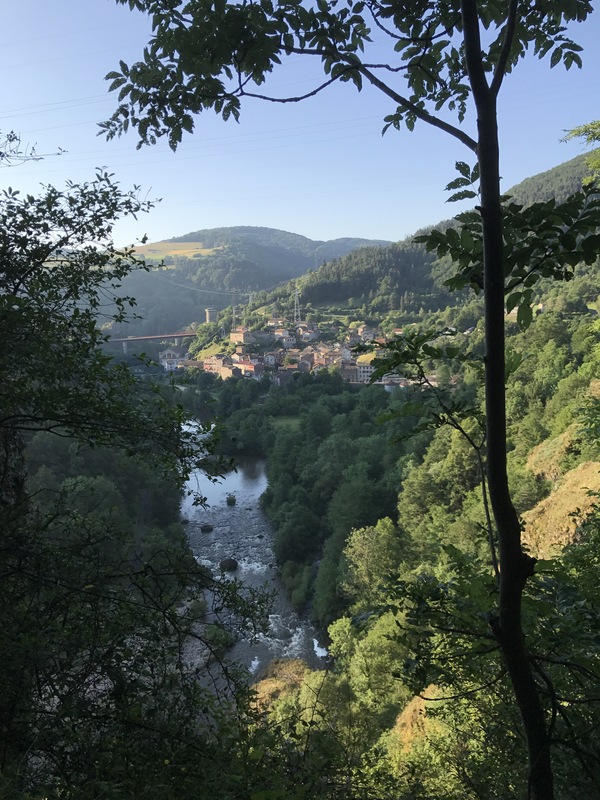 Three years later, it was on the third day or her third Camino that she and Lois were turned away from the albergue they had reserved because they arrived five minutes late. Our heroine couldn’t believe it, and tears sprung to her eyes. 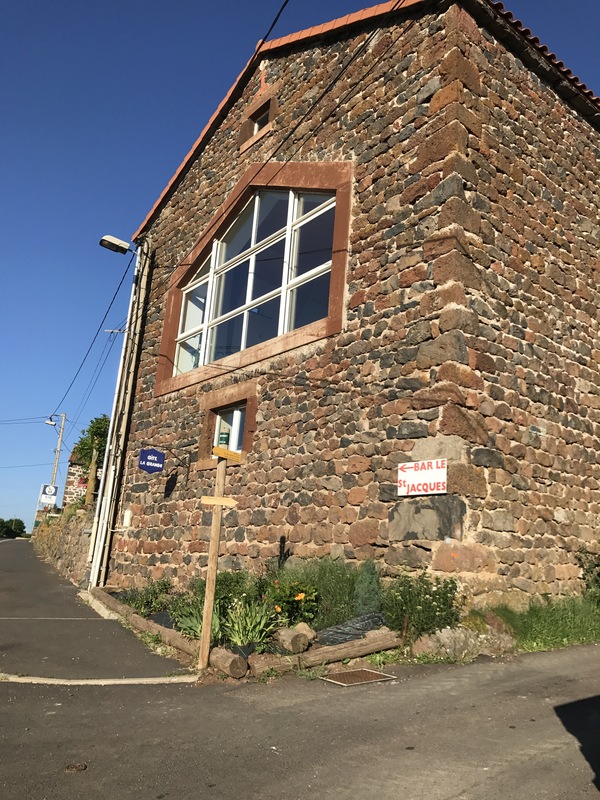 Lois took over and found them a beautiful place nearby–whose food and hospitality was so good that they stayed for two nights. Friends that stayed at the place from which Lois and our heroine were rejected (ironically called Corazón Pura— “pure heart”) were also mystified as they ended up being the only two people staying there that same night. When they asked the owners about turning us away, they were told something about not having enough food. I guess there was going to be no loaves and fishes miracle at that Corazón Pura that night! Our heroine, however, had forgotten all of this when she began her third day on the Via Podiensis. 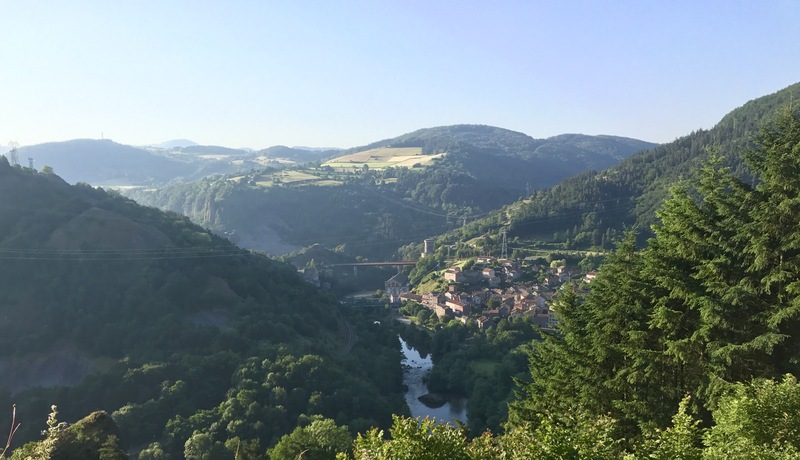 She knew the day began with a climb out of Monistrol d’Allier. The town sits on a river and she knew from elementary school that rivers often ran at the bottom of valleys. Thus, the ascent. 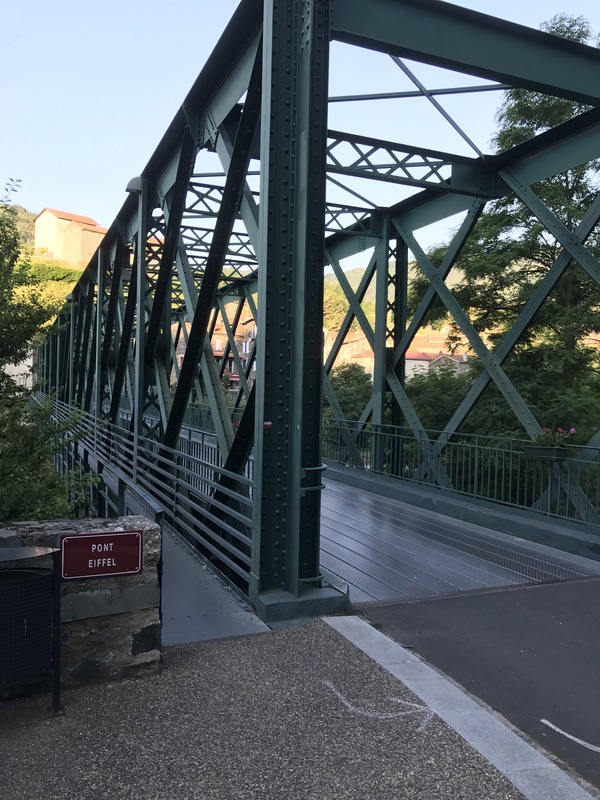 She started out at 7:10 a.m., crossing the Pont Eiffel, and appreciated that the heat had not yet descended. But she soon began to climb. She paused to catch her breath and to take pictures. The town got further and further away. She followed the red and white trail markers. She reached a chapel built under a large rock overhang, the town now well below her. At every fork, the trail markers always directed her to the higher road. Three hours after she began, she had walked just 4.2 miles. She knew normal walking pace was 3 miles per hour. She was not happy. She was very hot. Her pack pulled on her back, her shoulders. No matter how she adjusted it, nothing helped. She came upon an Austrian man, sitting I the side of the trail. He began his walk at his home 59 days earlier. They walked together briefly and when she stopped to rest he continued on, saying he would wait for her in the next town. As she continued, she regretted that he was waiting. She had to stop for another rest, some food, water. She thought she’d arrive to the next town in one hour. It became two. At noon, she finally arrived in Sauges. In the distance she saw a man sitting at a table in front of a bar, waving feverishly at her. Helfreit, the Austrian, welcomed her. “I hope you weren’t waiting long,” she said. “Just for one beer,” he said, indicating his empty glass. She moved to unbuckle her pack but he stopped her. “I have found a place for us to rest and have lunch,” he said. He took her down the street to a covered patio away from the noisy road. She started her meal with ice cream and orange soda. Then a sandwich. 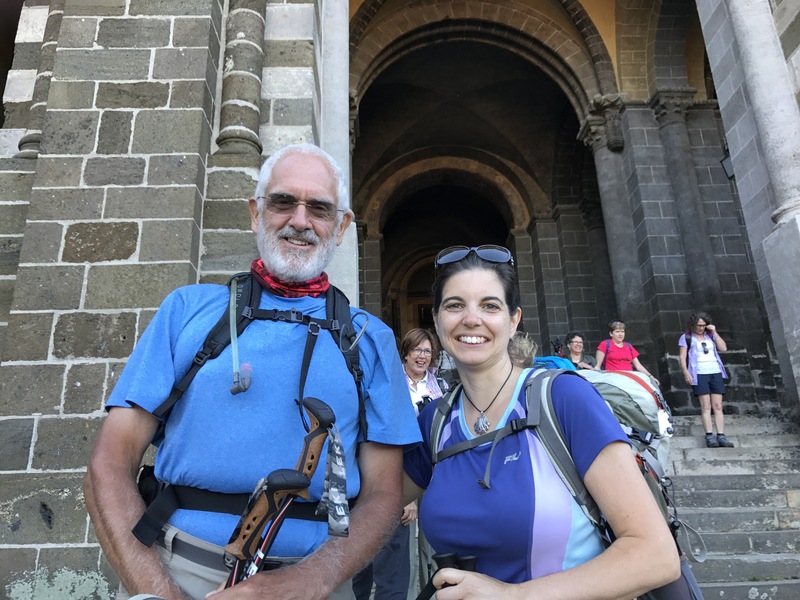 With the man who was nearly as old as her father, she engaged in conversations about life and love–more specifically the woman he met a few weeks ago while walking the Camino. Even after an hour/and-a-half break, she decided she could not walk to the gite she had reserved. Five-and-a-half more miles in the 90 degree was not going to happen. 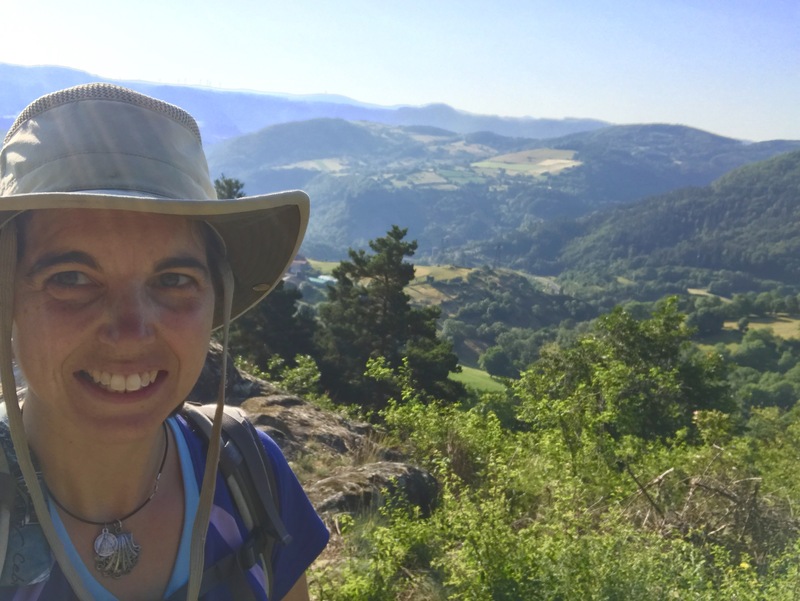 She had started this Camino slowly enough–with 9 and 10 mile days. Her mistake was thinking she could jump to a 14 mile day so quickly. “If you can get to La Clauze, I can meet you with the car,” he said. “Six kilometers. One hour.” She did the math in her head: 3.6 miles. At the rate she was going, she was hoping she could make it there in an hour and a half. She wasn’t impressed with Sauges, anyway. 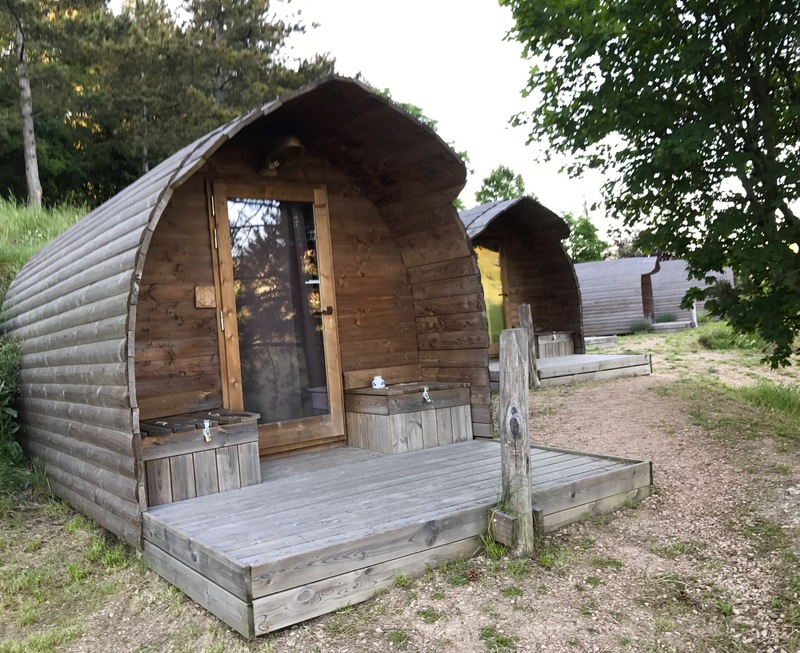 And she had heard his gite was wonderful. “Okay,” she said. He told her to call when she got to Le Clauze. Two hours later she threw down her sticks and her pack and called Jean-Louis. At first he didn’t understand what she was saying. I just called him two hours ago. How could he not know who I am? She searched her mind for the right words. Finally, he understood. A few minutes later, a car slowed and parked in front of her. Out stepped a plump man no taller than her, a smile showing beneath his handlebar mustache. He helped put her pack in the back of the van, and away she went, tired, hot, but happy she didn’t have to walk another step. Until tomorrow. 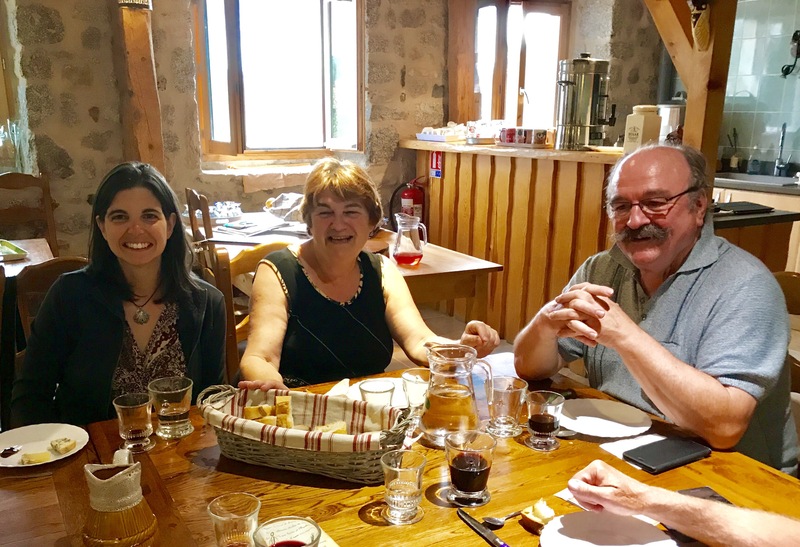 Our heroine with Lucette and Jean-Louis, the delightful and generous owners of the Auberge des 2 Pèlerins. 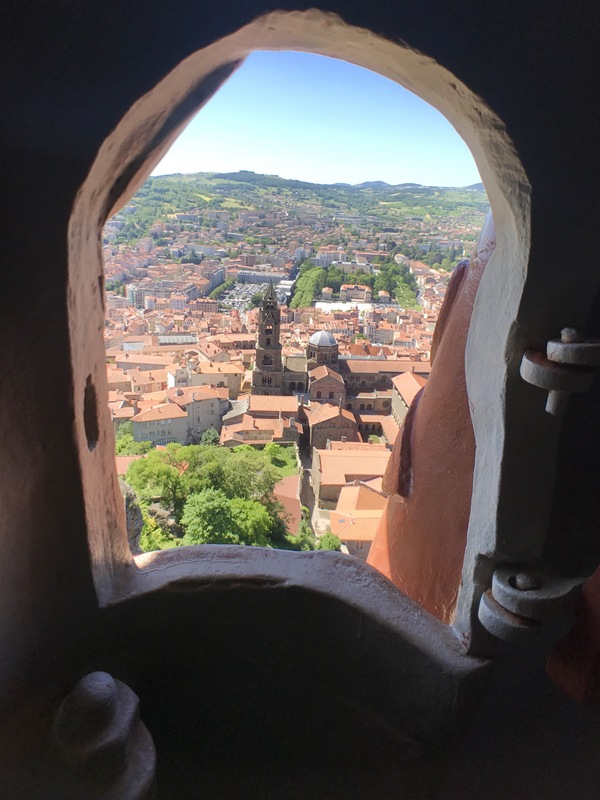 Last we left our heroine, she was about to spend her first night in her small cabin on the hill in Le Puy-en-Velay, France. She arrived to find the door more than a few feet in a jar. She walked in and saw that her roommate Isabelle had already gone to sleep, and left the door open because it was so stuffy inside the cabin. The cool air of the evening had yet to penetrate the very small space. She climbed into bed in her wrinkle proof dress and hoped for a good nights sleep. It was not to be. She tossed. She turned. In a couple hours the cabin cooled down. In a couple more hours it was downright cold. By the time she looked at her clock, it wasn’t worth trying to sleep any longer. And so at 5:30 AM on Saturday, June 17, she pulled out her journal and began catching up on her writing. Isabel awoke shortly thereafter, her goal being to attend the 7 AM pilgrim mass in the cathedral. our heroine stayed writing in bed because 1) she wanted to and 2) the cabin was really too small for two people to be moving in and out of it at the same time. After Isabel left, she went about her morning routine, and then walked into the town to meet David for a day of sightseeing. 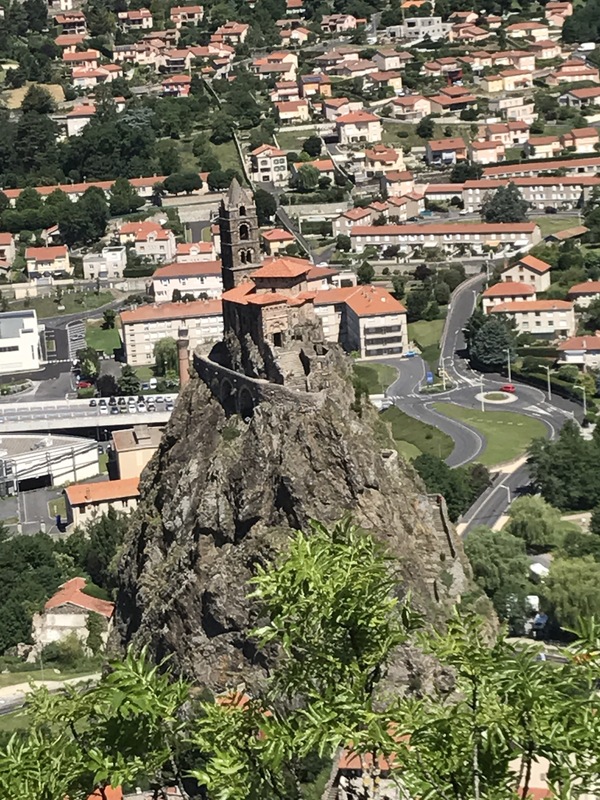 After devouring a pain au chocolat, they climbed up to the chapel of St. Michel, perched on a rock in the middle of the city And built in 962 by Bishop Godescalc who promised he would do so after returning from a pilgrimage to Santiago. 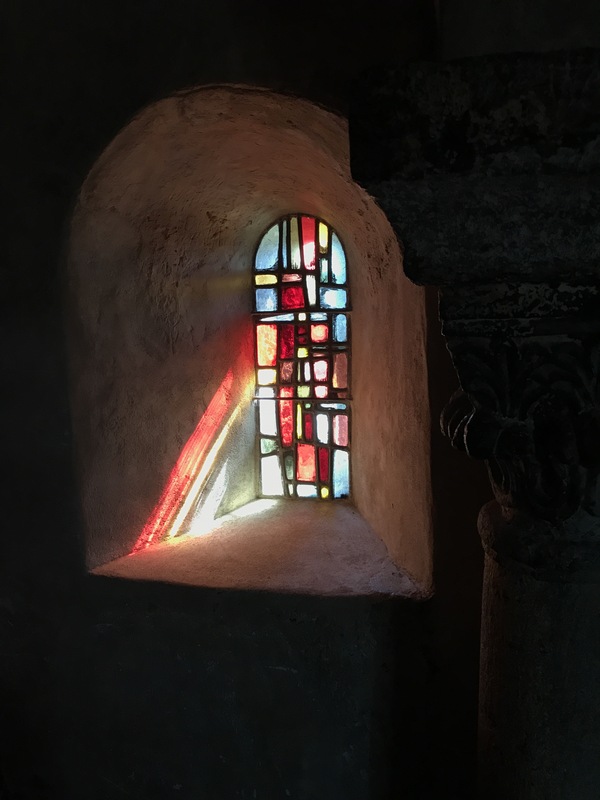 David–admiring the stonework? Contemplating life? 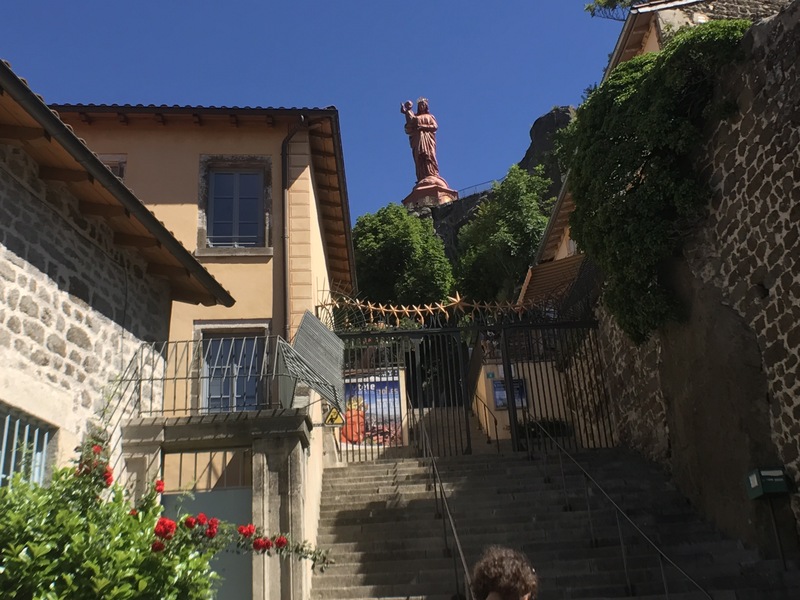 Not having had their fill of stairclimbing yet, they next ascended to the base of the Virgin Mary statue (Notre Dame de France). Made from the metal of Russian cannons captured during the Crimean war, it is perched on yet another rock in the middle of the same city. 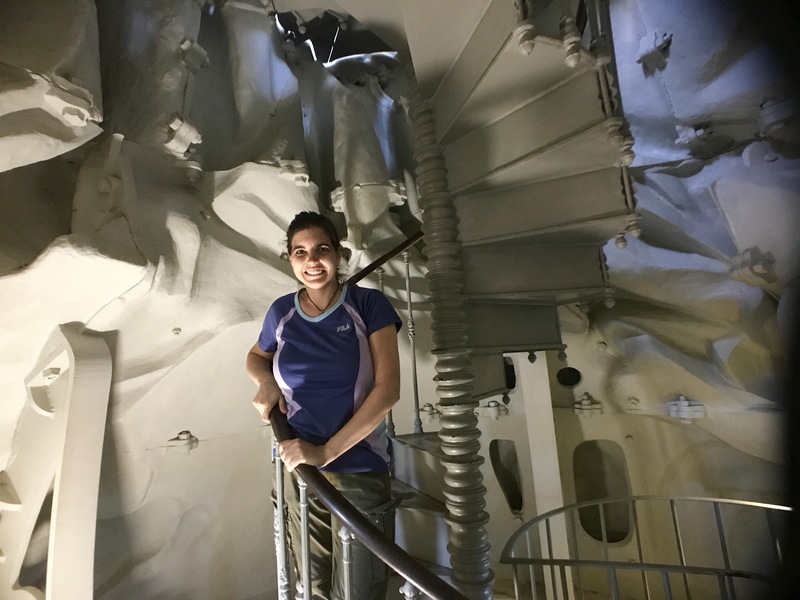 And as if arriving at the base wasn’t enough, they continued into the statue, David even managing to climb the ladder to peek out between her crown stars. Rebecca tried, but fear overcame her and she retreated. “I think I’ve had enough stairclimbing for one day,” said David. She agreed and they searched out a lunch option for David’s vegetarian lifestyle. 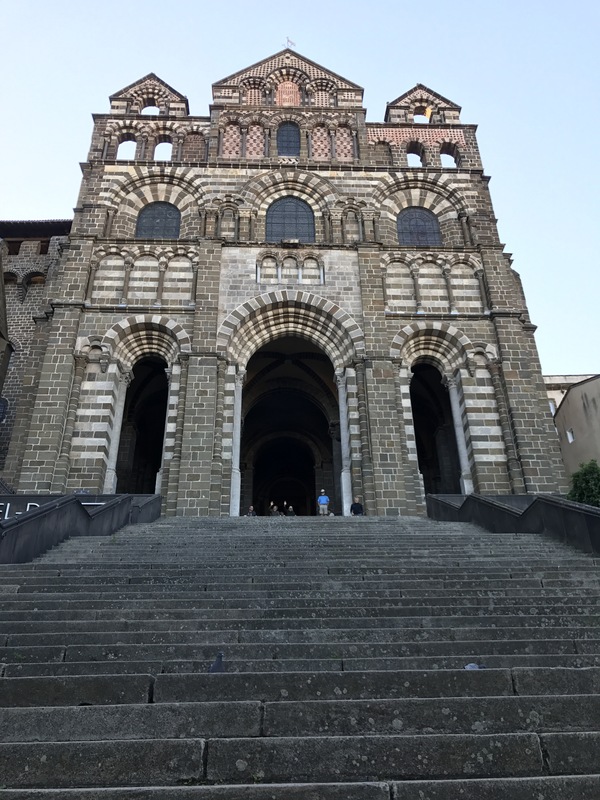 The region is known for its Le Puy lentils (“the caviar of the poor” she read the next day), which they both had as part of their lunch. 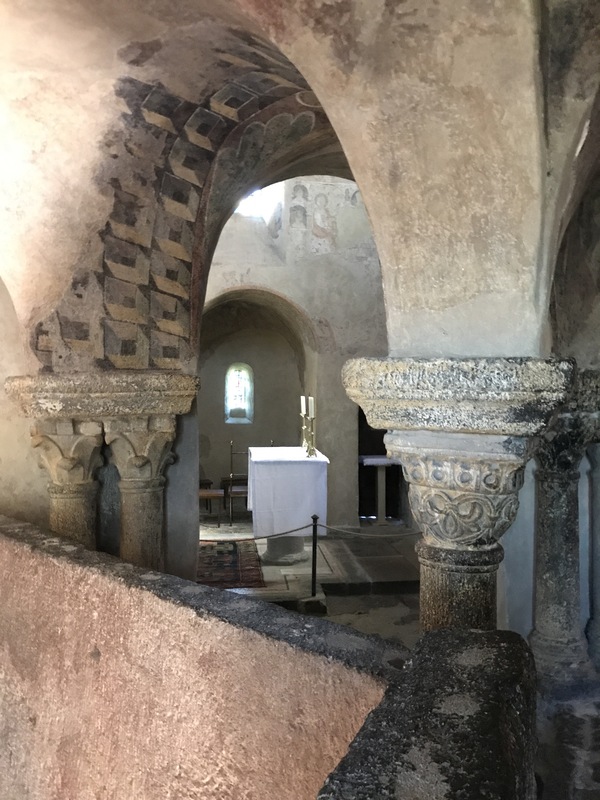 They paid a visit to the museum of the pilgrim: thoughtful words about the journey were shared in nine rooms — one for each portion of the walk. 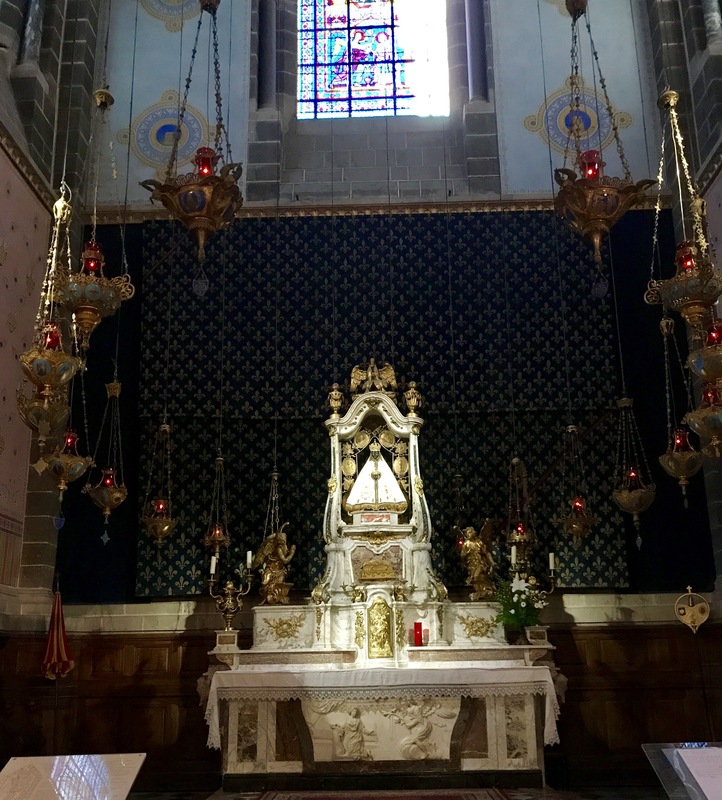 She walked inside the cathedral for the first time and was surprised to see a black Madonna. She recalled that these were unusual and sought out by some people, but she couldn’t recall more than that and was curious as to how came to be one here. 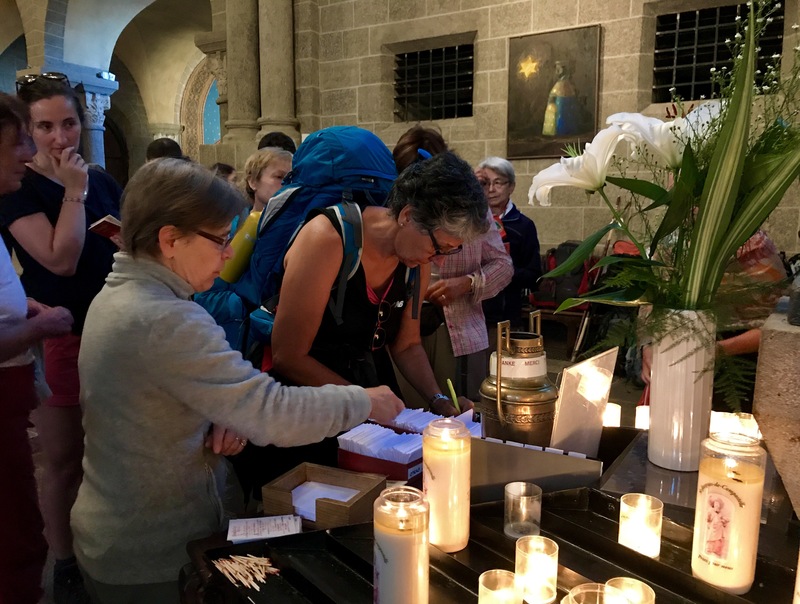 At 5:30 PM, they were welcomed into Le Camino–a space specifically for pilgrims who are leaving the next morning the way of St. James. Volunteers who had done the Camino welcomed them with a glass of verbeine — a local syrup made from verbana and, in this case, cut with water. It is popular here and also sold as a liquer. After a late dinner, she and David parted ways. 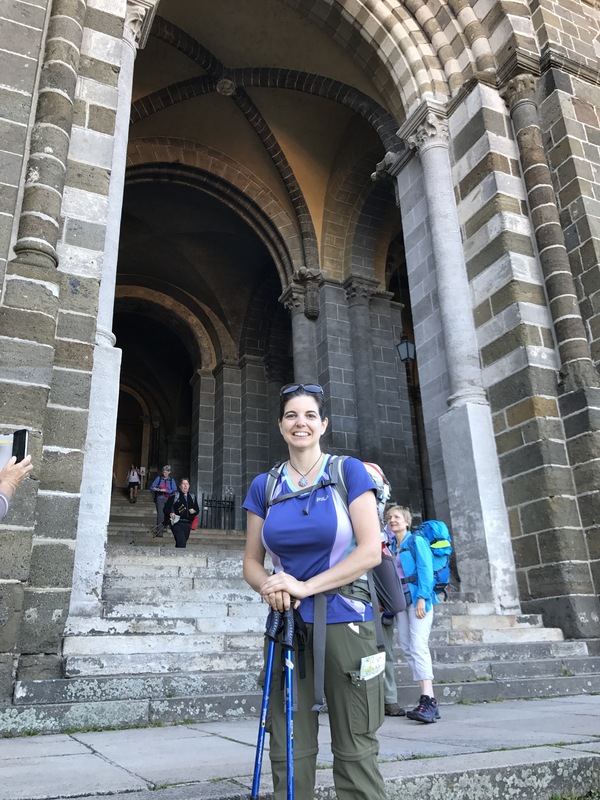 They would meet again the next morning at the Cathedral for the daily pilgrim mass at 7 AM, after which she would begin her journey on her fourth Camino, and David would continue his journey on his third. 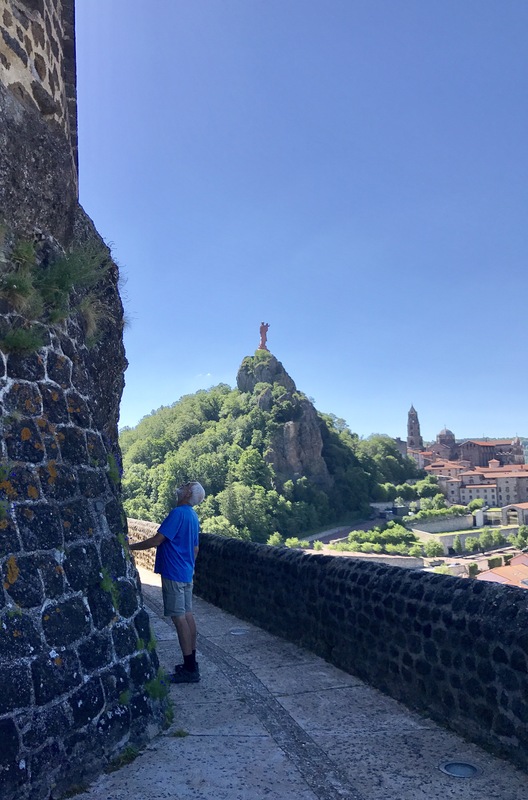 Girl leaves Lyon, France to head to her Camino starting point: Le Puy-en-Velay. One train and one un-air-conditioned bus later, she arrives. She hikes up out of the city 15 minutes to her cabin home away from home. She arrives two hours before she planned, and the owners are not there. There is a note on the door that says early arrivals can call a cell phone number, but the girl did not yet get a French Sim card for her phone and so cannot call. She thinks about sitting under the shade of a tree and writing for the next two hours. But her intuition tells her to go into town. And so she does. She descends back into the city, attains the SIM card, and then walks through a square only to hear someone calling her name. She looks up and is delighted to see her Camino friend from Asheville, David Vaughn, sitting at a table on a terrace overlooking the square. 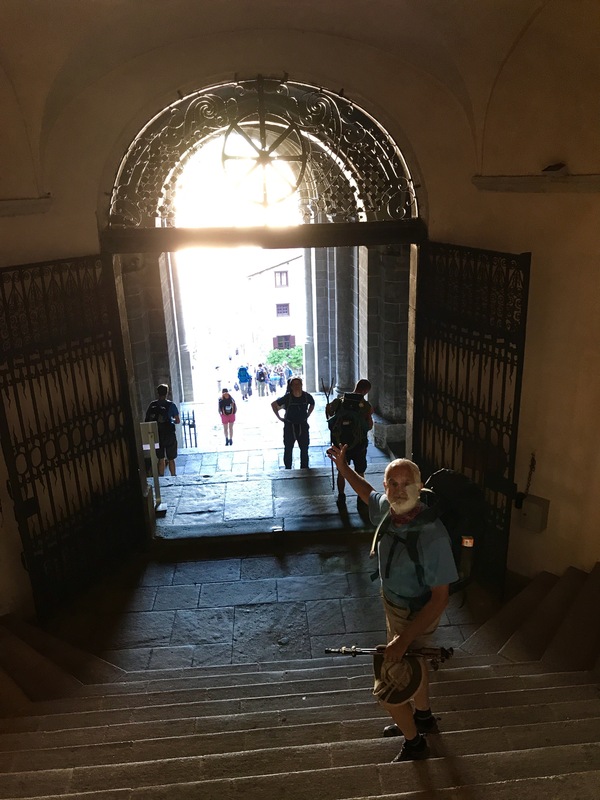 He began his third camino in Geneva a couple weeks ago. She and he had emailed and discovered that perhaps they would be in the same town on the same day. But neither had made any plans for how to find each other. I just figured I’d sit in one of the squares with a good view of all the people going by, and maybe I’d find you,” David told her. She had met David only once but in that short time she learned he was a minimalist living in a 700 square-foot house and therefore she wanted to learn more about him. 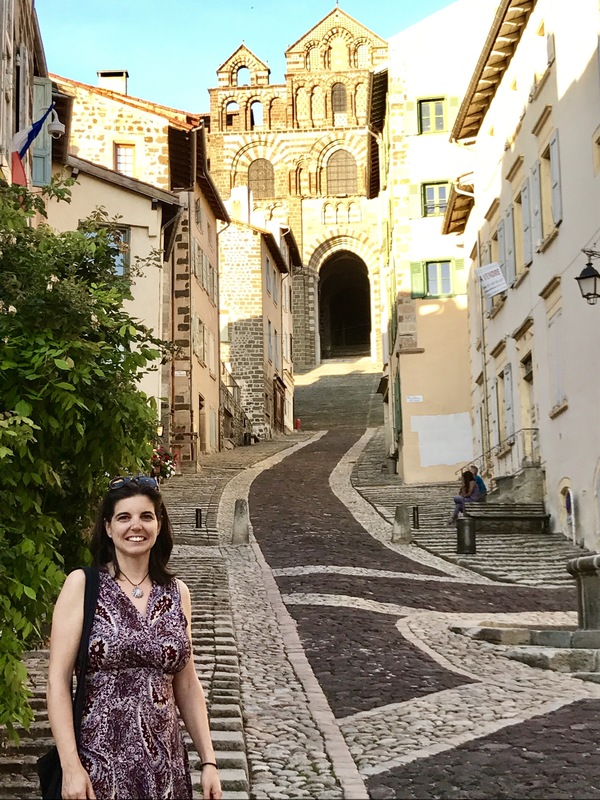 She is thrilled to be able to connect with him over a glass of lemonade in Place du Caizel–a world away from where they met. They sit fully engaged in each other’s stories. They talk over drinks until she has to hike back up to her cabin to meet her hosts. 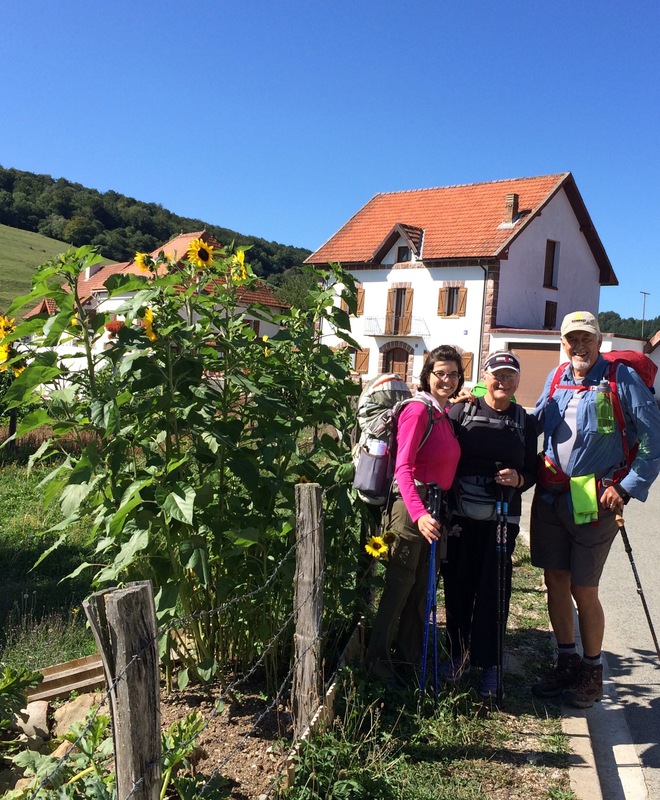 They later meet for dinner and, as often happens on the Camino, conversation quickly deepens. She learns he has a son her age. 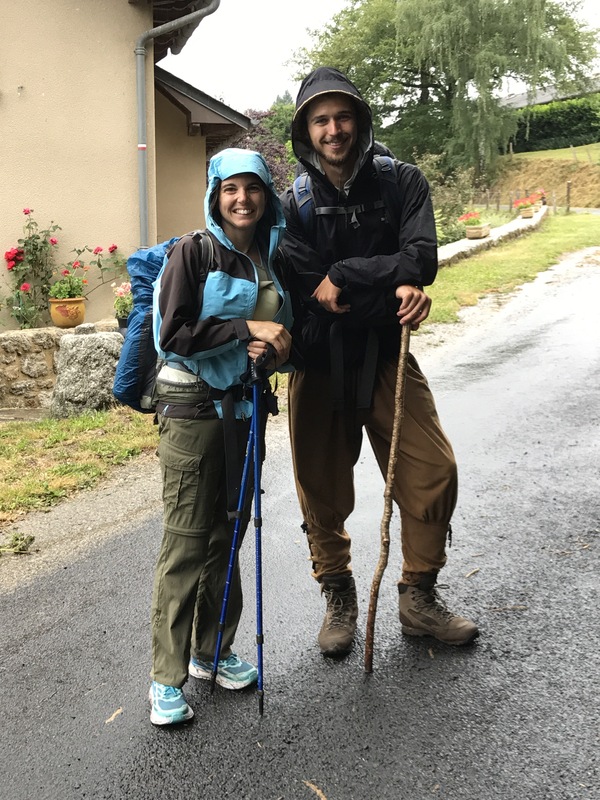 They talk of their families, their childhoods, and the generosity of their mutual Camino friends in Asheville, Chris and Esther. They climb the stairs up to the cathedral. 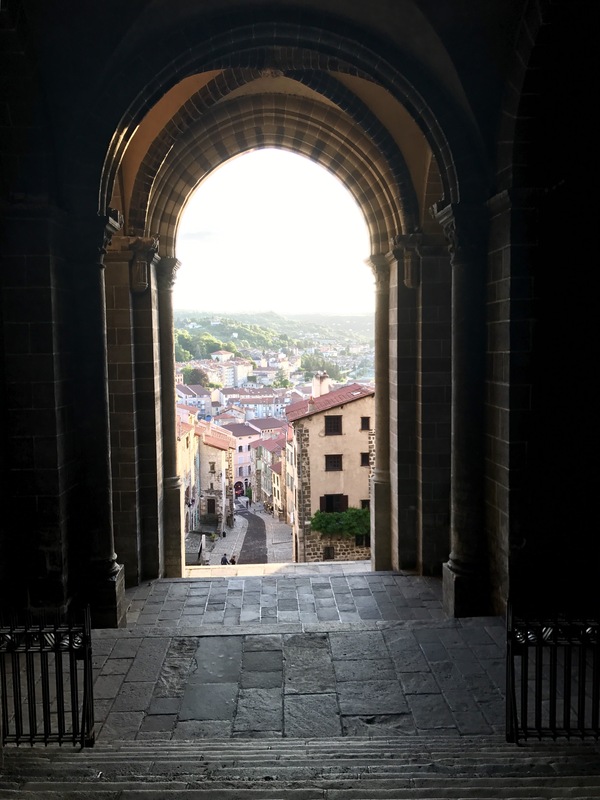 It is closed for the day, but they sit looking out at the view of Le Puy as they talk of time, busyness, and the tendency to live in the past or the future instead of the present. Me, delighted to have yet another travel companion to take my picture. Note that this is my “Camino dress.” My mother bought it for me prior to my first Camino and it’s been on every Camino since. 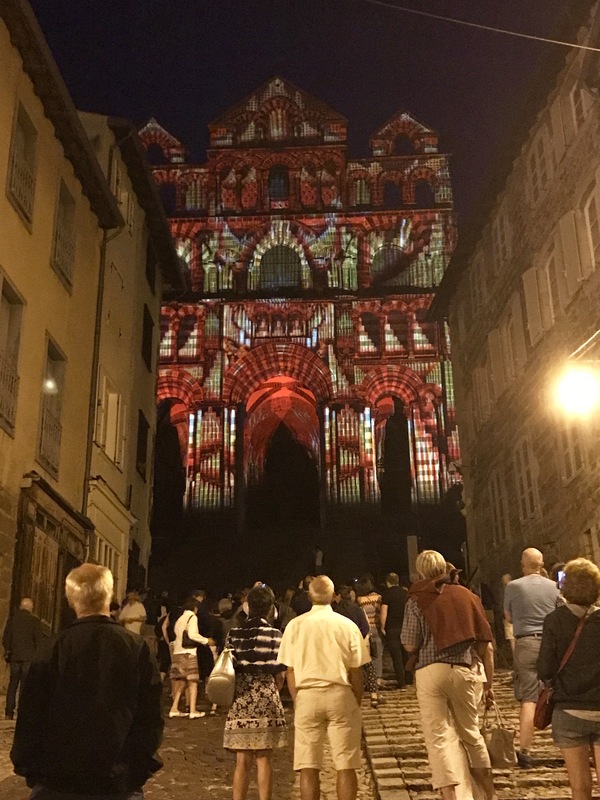 They do their best to stay awake as darkness falls so they can view the Lumières– The light shows the town has every night from May to September on five of its historic buildings around the city. They begin at 10:15 with the show at the theater, then walk over to see the one at the Hôtel de Ville, and finally the show at the Cathedral. The light show at the Cathedral. Note this was taken from nearly the same place as the picture of me earlier in this post. She had heard there were many interesting sites in the city and so had plans to stay for two nights. Earlier in his Camino, he had decided to do the same. “What time would you like to meet tomorrow?” she asked. He said, “How about you plan the itinerary for the day. Someone tells me you’re very good at that.” She laughed knowing it was probably Chris who divulged her determination to prepare and plan (sometimes too much!) for her Camino travels. They parted ways looking forward to exploring the city’s wonders the next day.